Nowhere will the impact of the Fourth Industrial Revolution be felt more than in the world of work. It was a hot topic for discussion at this year’s World Economic Forum in Davos. Here’s our line-up of what the experts are saying about it. “Sixty percent of people now live in countries with stagnant or shrinking workforces,” he said. 2. Meanwhile, “many members of the global workforce can’t keep up with the shift in skills required for jobs”, according to Allen Blue, Vice-President of Product Management and Co-Founder at LinkedIn. 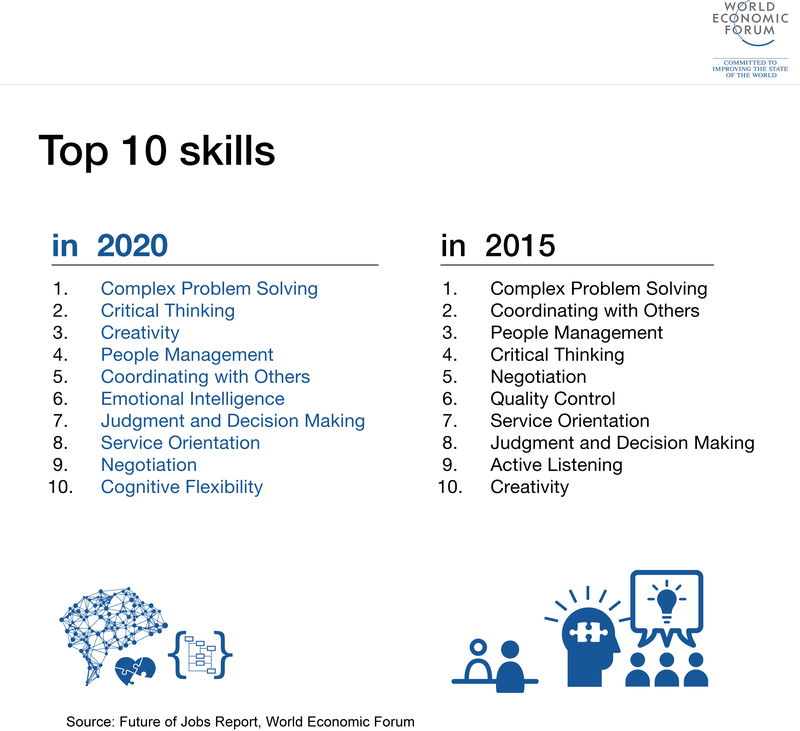 On average, by 2020, more than a third of the desired core skill sets of most occupations will be comprised of skills that are not yet considered crucial to the job today, according to The Future of Jobs report by the World Economic Forum. 4. “Currently, only 53% of chief human resource officers surveyed are reasonably or highly confident regarding the adequacy of their organization’s future workforce strategy to prepare for the shifts ahead,” explained Saadia Zahidi and Till Leopold from the World Economic Forum. In order to succeed, “businesses will need to put talent development and future workforce strategy front and centre to their growth”. 5. That strategy includes increased mobility, explains Alain Dehaze, CEO of Adecco Group: “Mobility no longer means merely traditional expatriate placements, but moving jobs to where talented people are located,” he said. “Mobilizing talent … is as much part of the Fourth Industrial Revolution … as water and steam were in the first,” he added. “For regulators and governments, structural reforms to remove barriers and bureaucracy and the simplification of labour markets remain paramount,” he said. 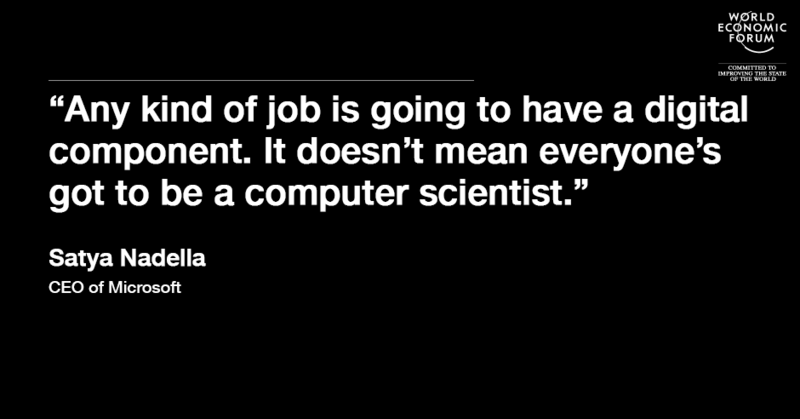 What will jobs look like? “Technology can help more people and more broadly than any other industrial revolution,” he added. 8. Jobs gains in the next five years will not be enough to offset expected losses, said Saadia Zahidi and Till Leopold. “If you are choosing your college degree today, STEM skills are a good bet,” they say. 9. Let’s not forget, though, said Sheryl Sandberg, COO of Facebook: “Yes, tech creates huge disruption but it’s also the case that tech powers things in the non-tech centre and very much in the entrepreneurship space." 10. “This revolution will produce winners and losers. Our job is reduce the number of losers,” added Paul Kagame, President of the Republic of Rwanda. The Annual Meeting took place in Davos from 20 to 23 January 2016, under the theme Mastering the Fourth Industrial Revolution.